We know everything about roofadvertising! We take care of the whole route in roof-advertising. We take care of your design, print and place your sky-sign. Full-colour roofing on your rooftop is now available! That means you can turn your roof into an eye-catcher on Google Earth. Furthermore, it creates possibilities for architects. All eyes are on your premises from out the plane or helicopter: In short, roof advertising is an indispensable marketing-tool! We offer unique and innovating products in roofing. 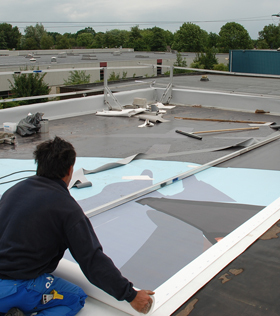 There for we are able to offer you full-colour advertising directly on your roofing-material. The creative possibilities from now on are unlimited. To give you an idea we have put some examples of roof advertisement on this website. Don’t hesitate to contact us for extensive information. For all challenges we offer solutions, mainly because we have the experience in all shapes of advertising and expertise in roofing!